With the Jeep in tow we headed east from Traverse City to the east side of the state to Harrisville State Park. Being the last week of June we decided to make a reservation to insure a spot. Our original choice was a beautiful site overlooking Lake Huron but holiday travelers had reserved that spot for Thursday night which meant we would have to move from the site for an additional night stay. Once in a camp we do not like to site hop so we choose a nice drive through site that was large (50x60) and had partial shade. This site did lack character but would be our home for our mid-week excursion. 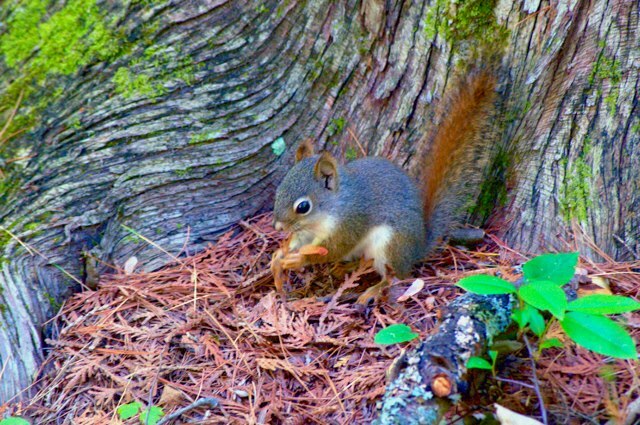 Harrisville State Park (256 sites) and it’s small sibling Newton State Park (4 tent only sites) are nicely nestled on the shore of Lake Huron within walking distance of the Harrisville Harbor, or a short drive to Sturgeon Point Lighthouse and the resort town of Harrisville, Michigan. 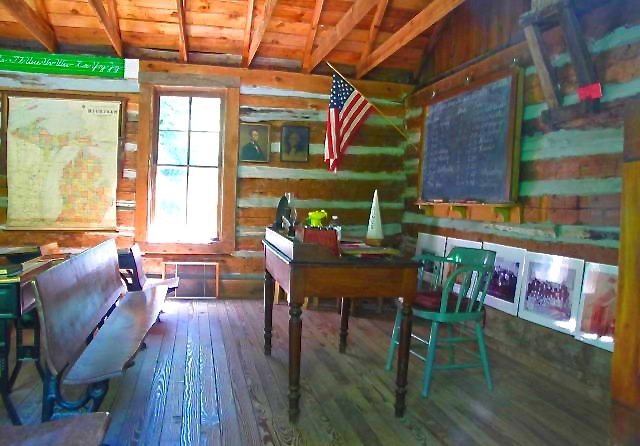 Harrisville State Park is one of the oldest in the state park system. The camp forest is a combination of hardwoods, pine and cedar. The beach is pure white sand with patches of washed stone and an occasional Petoskey stone to keep the interest of rock hounds. 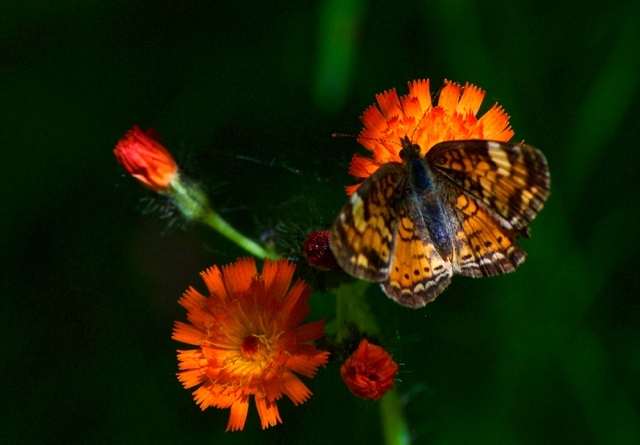 So why make your vacation or even stop at Harrisville State Park? To paraphrase Connie Higgins of Harrisville State Park when I asked “why come to Harrisville?” she said The Beach! the forest the serenity and laid back style of the area. One night in the park and you will agree. As part time RVer’s we have long since grown tired of the crowds, the traffic, the noise of the more well-known destinations and parks. The simple pleasures of an open road, low or no traffic, no lines and abundant nature have real appeal to us. So if you are not a beach nut this park still has a lot of appeal. 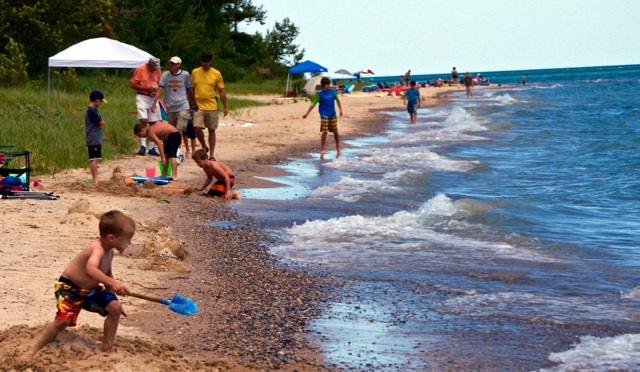 If you want lake front camping, choose from sites 52 through 103 to be on the lake. Some of these sites are good for full size rigs and some are more designed for smaller campers or tents. The state reservation web site will indicate what fits and how level they are. Maybe the beach is not what excites you. 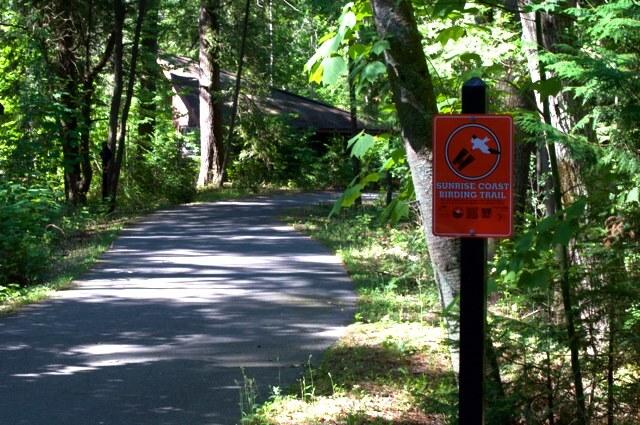 There is a short nature trail (less than 2 miles) and paved pathways free of cars for the young or more mature to hike or bike on. 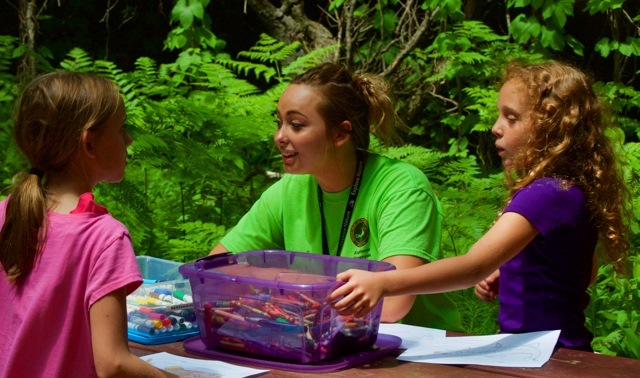 The park also offers interpretive nature programs on a regular basis through the summer months. One of the staff presenters let me sit in on a children's session that focused on the state bird the Robin. While her audience was small she had their interest from the start. 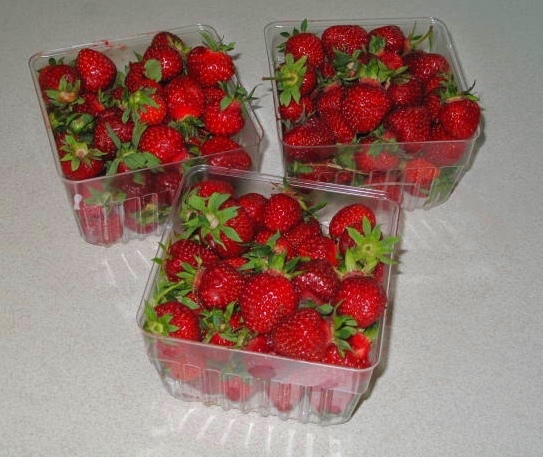 For those that want more than the beach, hiking and peace of the park the resort town of Harrisville is a short hike (or drive) away with many interesting food emporiums, shops, a marina on the big lake and when the season is right fresh strawberries at a roadside stand. We of course had to stop at “The Garden” restaurant for an excellent lunch followed by a trek across the street for a few quarts of fresh Michigan Strawberries. Now Michigan strawberries are not the giants of California. These berries while smaller provide an explosion of flavor, a lot of flavor. Their aroma is a meal in itself. 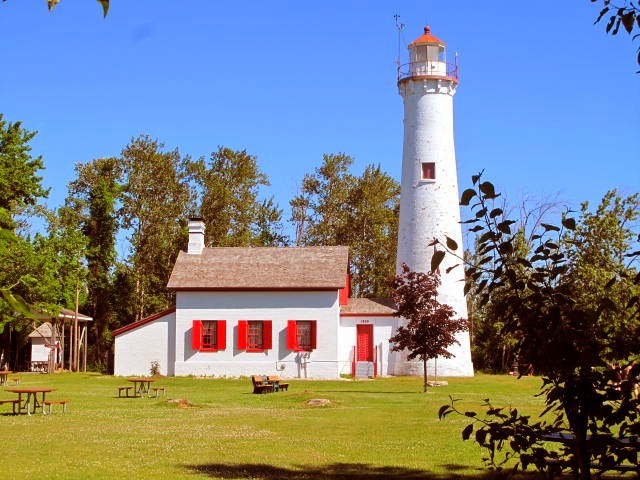 After a nice lunch one can wander north a few miles to the Sturgeon Point Light House and the Bailey Schoolhouse Museum for a glimpse of life in the north from the late 1800’s. Or you could drive south to Oscoda and visit the Wurtsmith Air Museum. 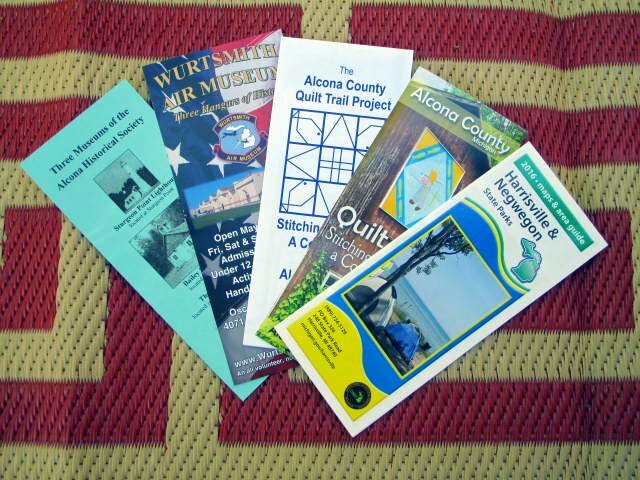 If you would like a drive through the country side, you can give the Alcona County Quilt Trail a go. This self-guided trail map is available right at the check in station of the campground. 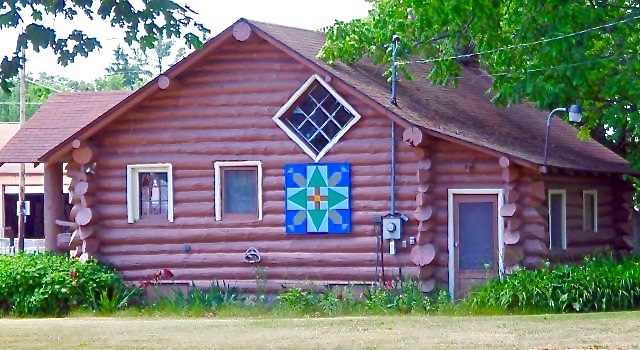 Whether it be camping, boating, swimming, hiking/biking, touring, fishing or hunting the Harrisville State Park is a great place to set up your base camp. If there is a down side to this state park (and I am working hard to find one) the park suffers from the same illness of most of the Michigan parks. The lack of budget. Could picnic tables be in better shape, Yes, could more sites be paved or at least compacted gravel, of course. Could the fire pits be in better condition, absolutely, but the staff goes above and beyond to make your stay as comfortable and relaxing as possible. The park is maintained, mowed, cleaned better than many of the “destination” RV parks we have experienced. Of the many employees I talked with there was nothing but a positive friendly can do attitude. Security is provided by both park rangers and local sheriff patrol. 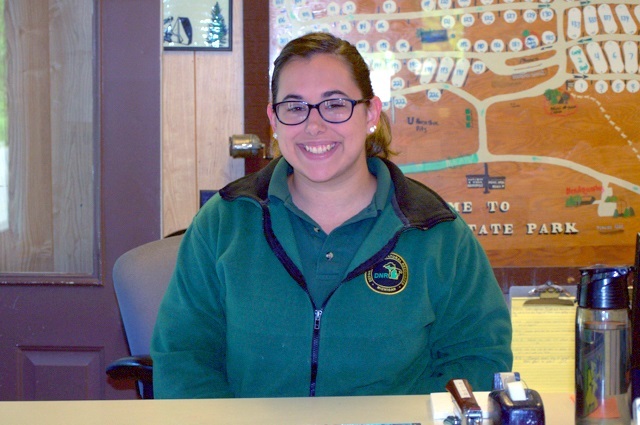 Of the many bright stars of this park I must admit the staff shine the best. 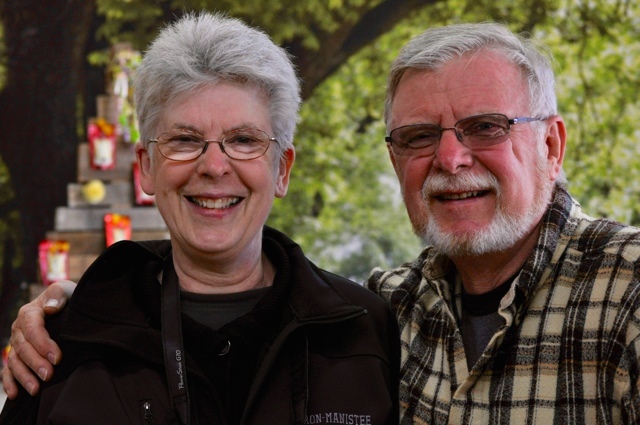 When you are ready to get away from the busy hustle of RV and tent camping plan to visit Harrisville State Park on the lost coast of Michigan. You won’t be disappointed and you may actually be able to relax.